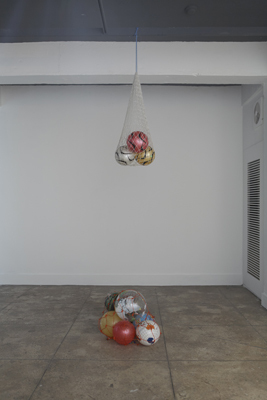 Kim juxtaposes balls from a Kiosk in Berlin Neukoelln, an immigrant area, and from Dongdaemun in Seoul. The Berliner World Star balls and the Seoul globes, Sun, watermelons and the one with bumps bear certain similarity yet are very different – none of them have clear place of origin. 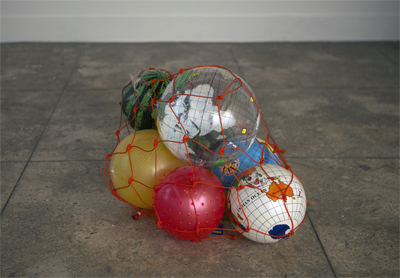 They land on the exhibition space, after having travelled untrackable routes. They are paired following their own idiosyncratic secrets, presenting a different perception of the volume to the given architecture of the exhibition space. 작가는 이민자들이 집중된 주거지역인 베를린 노이쾰른의 편의점에서 발견한 공과 언뜻 이와 비슷하지만 다른 서울 동대문의 공을 병치시킨다. „월드 스타“라는 로고의 베를린 공과 지구, 태양, 수박을 본따거나 돌기가 나있는 것 등 서울 공의 원산지는 모두 알 수 없다. 추적하기 어려운 경로들을 거쳐 전시장에 안착한 공들은 그들만의 비밀을 가지고 임의로 짝지어지며, 전시장에 또다른 부피감을 선사한다.